Back in April, Culturebaby was busy and couldn't make the annual Family Weekend at Sadler's Wells Theatre, so Museum Mummy very kindly offered the tickets to us in return for a guest blog on the event. 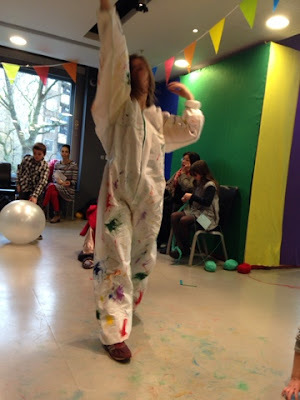 The main attraction of the weekend was the dance show, Constelaciones (Constellations), inspired by the collection of pieces by Spanish painter, Joan Miro, and performed by dance troupe, Arcaladanza. On Easter Saturday, my husband and I got on the train with two of our daughters, aged 2 and a half and 2 months respectively. Baby was safely stowed in the sling and CultureBuddy was excited to watch the trains rushing by as we ventured into the Big Smoke for what promised to be a colourful dance extravaganza, offering delight in equal measure to children and adults. 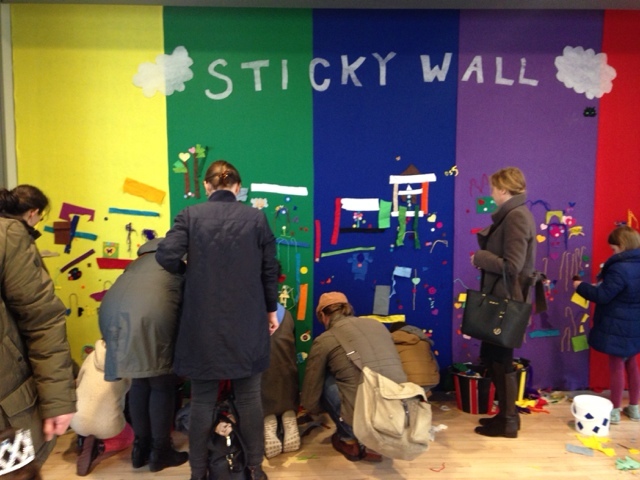 On arrival, we discovered an array of imaginative activities arranged for families in the atrium above the main foyer. Baby snoozed with Daddy, while CultureBuddy and I explored…..we found a giant fuzzy felt wall and all the materials you could desire for making your own fuzzy felt pictures. 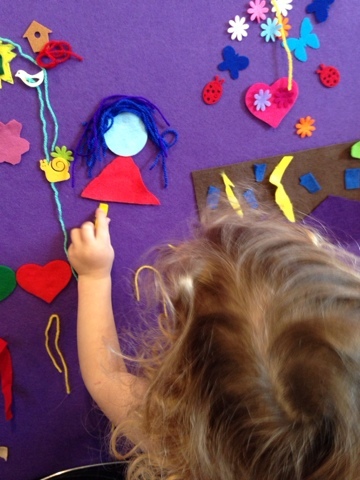 After we constructed a blue-haired beauty, complete with red dress, we went on to draw a wish for a wish balloon to be stuck on a giant cloud, which over the course of the afternoon became covered with blue-white bubbles of aspiration. CultureBuddy's wish was instantly granted, much to her gratification, as she had wished for her balloon to join the cloud. 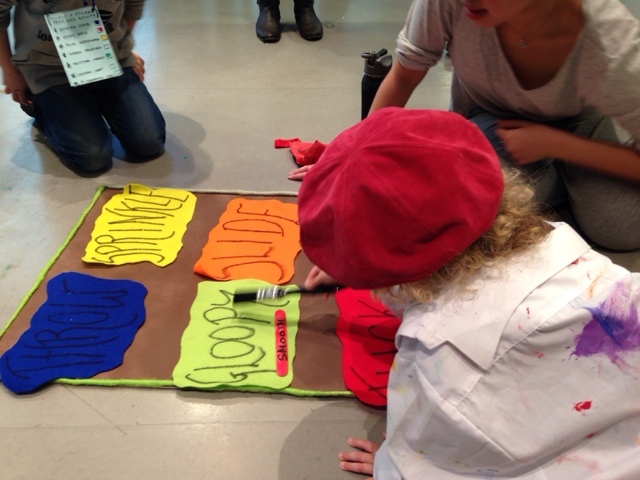 Last, but not least, CultureBuddy donned an artist's shirt and hat and set to work with her paintbrush using a palette of movements to control a dancer. Each mini-artist was given three lolly sticks, marked 'low', 'smooth' and 'high' and placed them on the colours on the palette, which in turn denoted different movements for the dancer, including 'slide', 'throw' and, my personal favourite, 'gloopy'. 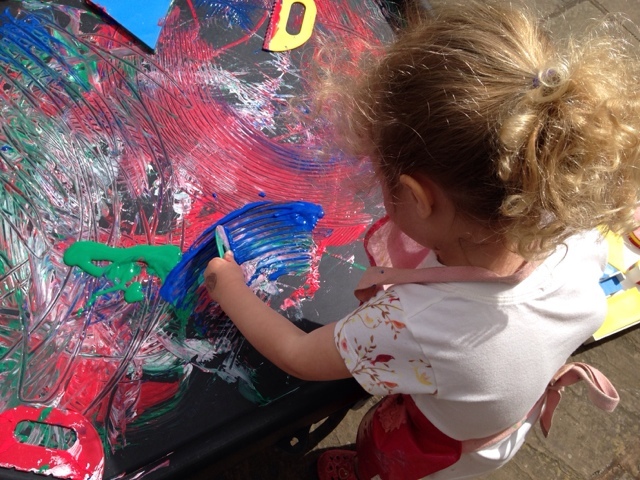 Using her paintbrush to point at the different colours on the palette, CultureBuddy watched with glee as the dancer followed her commands. At last, it was time for the main feature - the show. We entered the darkened theatre and took our seats. Slowly, the audience hushed and the curtains rose. White smoke began to gently fill the stage. Two dancers entered, barely visible in the dark, each holding a flashlight, throwing beams of light into the house via the medium of the smoke. They approached an array of what looked like small black tubs on rails and held their torch over each individual tub. As they did so, the tubs became illuminated, one at a time. The dancers were pouring light from their torches into the stage lighting, which had been lowered down onto the floor for them! The optical illusion was enchanting and younger members of the audience would have been forgiven for believing that the laws of physics had changed and luminescence could flow like water. So began the magic of the show. 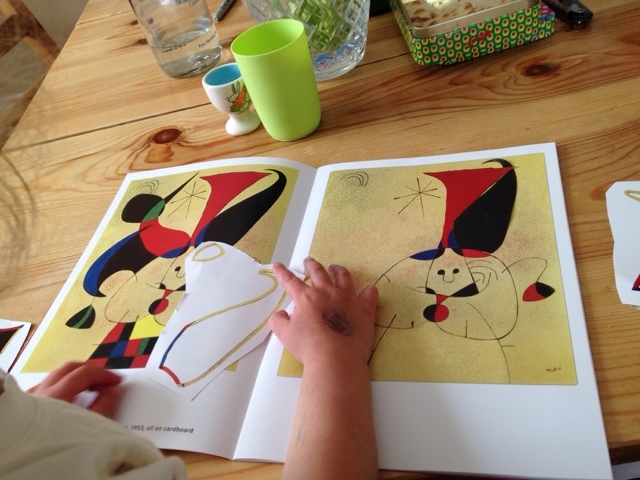 It was made up of a number of short pieces, all light hearted and beautifully playful, building on the iconic shapes and colours of Miro's paintings. Dancers competed with over-sized blue balls, which they sat on, rolled and chased each other with. Every so often, a man on a bicycle rode across the stage, with brilliant small lights suddenly appearing in his hands. The costumes were often an integral part of the show and used to full effect: at one point, the dancers lay inside hollow tubes of black fabric, creating the Miro's famous black lines and moving them to music; artists strode on wearing huge bulbous suits, which they unzipped to release black bean bags, one at a time and then in a flurry, finally arranging them in rows, stepping stone style across the stage. CultureBuddy's favourite was a wonderful dress which extended in a V-shape above the dancer's head. It was illuminated with a multitude of twinkling stars and changed colour as the dancer rotated on the spot. The whole show was highly enjoyable and charmed all of us, excepting always baby, who fed and then slept throughout the show. 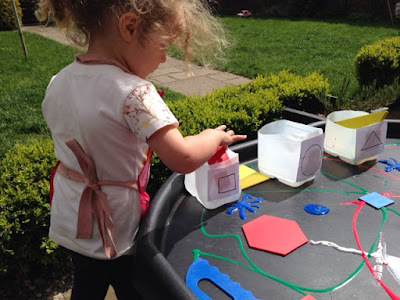 At home, I wanted to build on the experience of the show and also involve my two older children: we are a home educating family and as we grow, I am finding that enlisting the older children in helping to create something for their younger sibling is a fun way of us learning all together. 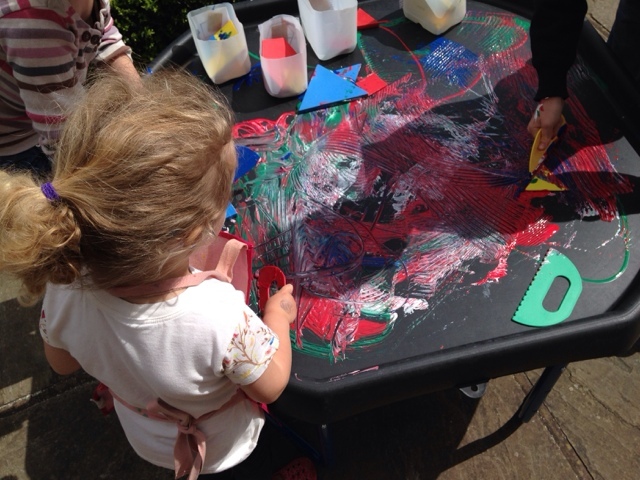 We looked at photos of Miro's Constellation paintings online and the children found two videos on you-tube for CultureBuddy, bringing Miro's work to life through animation. The children then helped me to assemble a Miro themed tuff table, using colourful plastic shapes and connecting them together with ready-mixed paint, straight from the bottle. 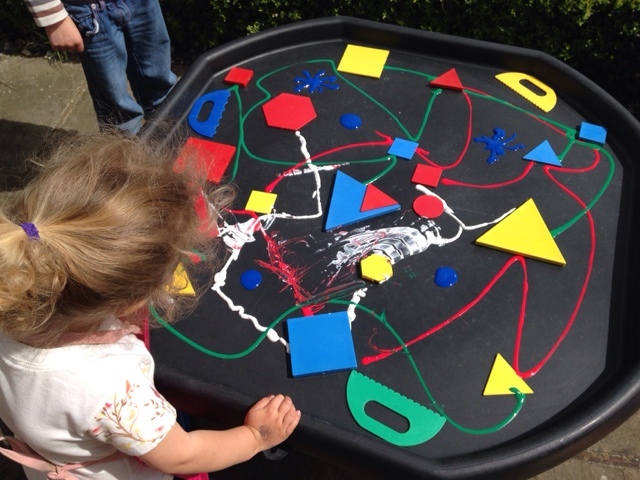 Culturebuddy experimented with squirting copious amounts of paint onto the table herself and using paint scrapers to make her own patterns and colours. 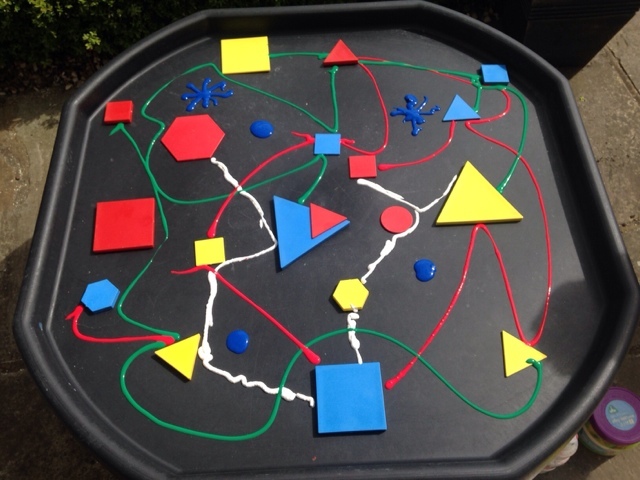 Under the direction of her siblings, she was able to sort the plastic shapes into separate pots for triangles, circles and squares. 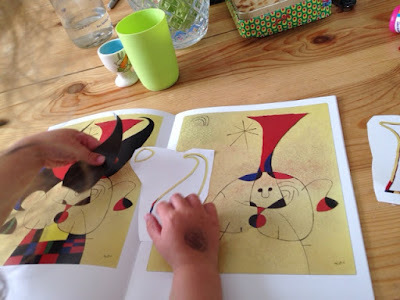 Finally, all the children had a go at re-producing one of Miro's works with the book, Sticker Art Shapes: Joan Miro, which is ideal for young children. On one side, there is a picture of an original Miro masterpiece and on the opposite page, a copy with several elements missing, which the child finds on their sticker sheet and puts into the correct position. We had a lot of fun before, during and after the show, and this blog comes with a big thank you to CultureBaby for allowing us along for the ride. Although more people nowadays believe it is important for their personal care products to be natural, there is still extensive use of personal products that are chemical concoctions and extremely unhealthy when used continually. Babies especially are susceptible to toxic chemicals as their immune systems have not had time to develop resistance. Organic baby https://www.babykidshq.com/are part of a new trend toward healthier and safer products, whether it's organic foods, clothing or personal care products. Organic growing is only part of the importance, as there are other factors besides the ingredients.